The College of Engineering has more than 50 named professors and chair positions, supporting faculty who are conducting research in life-improving areas from renewable energy to fighting disease to cybersecurity. 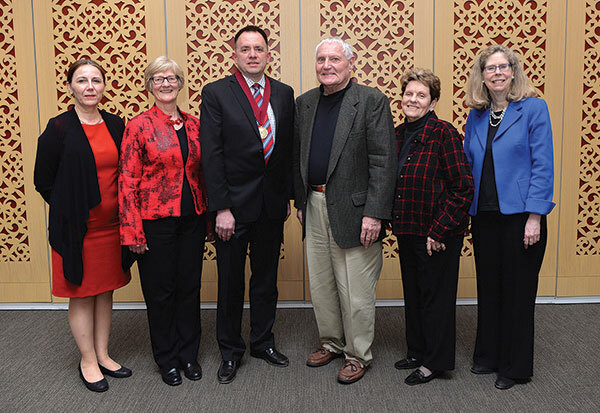 “Donors to the College of Engineering are incredibly committed to making a difference, and they are making an investment in a better future for us all by supporting faculty at Iowa State,” said Rajala. In this issue, you can read more about the pioneering research conducted by faculty supported by philanthropy. Learn more on page 4 about our National Science Foundation CAREER winners, many of whom have been supported by Black & Veatch Building a World of Difference Faculty Fellowships in Engineering. And on page 10, see how Robert Brown, Gary and Donna Hoover Chair in Mechanical Engineering, is leading the nation in biorenewables processing research.